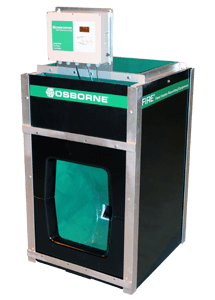 The all new Mark IV Osborne FIRE (Feed Intake Recording Equipment) Feeder is a true ad-libitum feeder that automates the measurement of an animal’s individual daily feed intake. 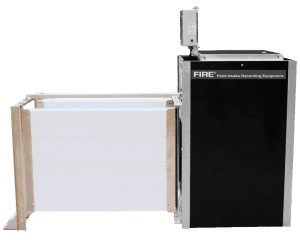 FIRE has been the gold standard in pig performance testing for nearly 25 years. 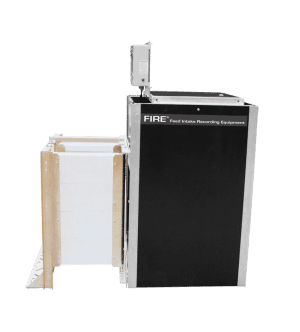 New features for the Mark IV FIRE system include an impact- and corrosion-resistant pDCPD plastic Feed Saver Front Panel that features an over-turned lip to minimize feed spillage under the trough. A trough alignment and stabilization kit is now standard and improves the accuracy of the feed trough. Using RFID (radio frequency identification) technology, animals are identified at the FIRE Station, allowing FIRE to assign all measurements to records. 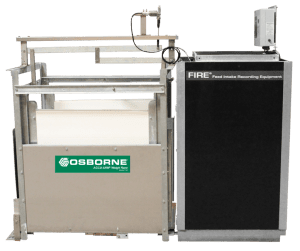 A sensitive load cell continually weighs the trough and feed, allowing FIRE to record the time and duration of each unique visit, along with the weight of feed consumed. The information is transferred in real-time to a personal computer into the WinFIRE RT™ software application to generate reports and study. Dimensions 27 x 26 x 54 3/8 in. Raises feeder off floor away from debris for more accurate weighing. Increases capacity of hopper by 75 lbs. (34 kg). Polyethylene construction. One transparent window. * Capacity varies depending upon feed type and animal behavior. + Feed capacity based on feed density of 42 lbs. per cubic foot.